Please note: API changes are likely as we continue to develop this plugin. Under Credentials, choose Create Credential. Note: For development, you can create an unrestricted API key that can be used on both iOS & Android. For production it is highly recommended that you restrict. The way you register your API key on iOS vs Android is different. Make sure to read the next sections carefully. Note: If your iOS and Android API key are different, be sure to use your iOS API key here. Add code to show the MapView. //Add a method to call to show the map. Your Bundle ID does not match what is registered in the Google API Console. When you create an restricted API key in the Google API console it asks you to specify your iOS bundle ID. Make sure that your iOS Bundle Identifier matches the one you registered in the console. Using the wrong key. If you made a separate key for iOS and Android, make sure you are using the iOS key in the MapView.setApiKey() call. In your AndroidManifest.xml, add the following uses-permission above the <application> tag. In your AndroidManifest.xml, add the following lines inside of the application tag. Be sure to replace your_api_key with the one you generated. Run your application on an Android device or simulator. Confirm that when you display the map you see map detail. If you only see a beige screen it's possible that your API key is incorrect. 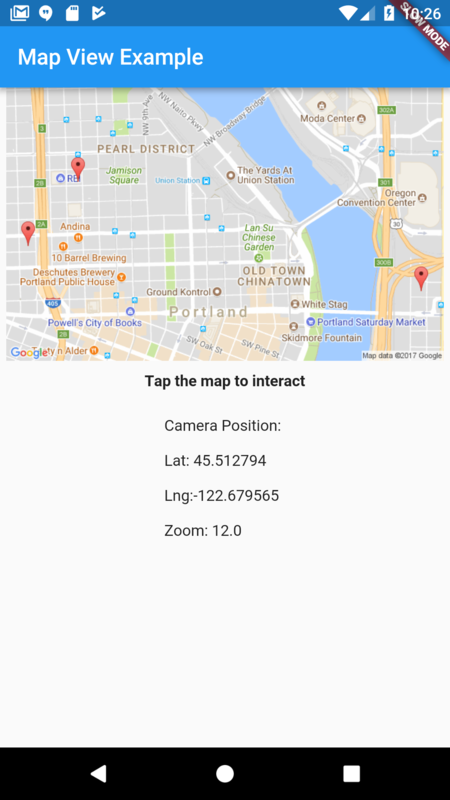 This plugin does not currently support displaying a Google Map within the Flutter widget hierarchy. A common workaround for this is to show a static image using the Google Static Maps API. Included in this Plugin is the StaticMapProvider class which will allow you to easily generate a static map. The Static Maps API also requires an API Key and you must enable the API within the Google API Console. Once enabled, you can use the same API key you generated for iOS/Android. You can refer to the example project if you run into any issues with these steps. [X] Remove markers, polylines & polygons. First add your assets to a folder in your project directory. The name of the folder could be any but "images" or "assets" are the more common. It should look like this. Then add asset to the pubspec.yaml under flutter tag. Finally use the asset name as icon for your marker. If the width or height is not set or is equals to 0, the image original value of said attribute will be used. draggable: true, //Allows the user to move the marker. First set the draggable attribute of a marker to true. Now add listeners for the events. // This listener fires when the marker is long pressed and could be moved. var location = markerMap[marker]; // The original location of the marker before moving it. Use it if needed. // This listener fires when the user releases the marker. var location = markerMap[marker]; // The actual position of the marker after finishing the dragging. // This listener fires every time the marker changes position. var location = markerMap[marker]; // The updated position of the marker. Fixed bug where adding annotations would fail after displaying map a second time. Fixed dependency problem with uri package. Demonstrates how to use the map_view plugin. Run flutter format to format lib/map_options.dart. Run flutter format to format lib/map_view.dart. Run flutter format to format lib/map_view_type.dart. Run flutter format to format lib/polygon.dart. Run flutter format to format lib/polyline.dart. A fork of flutter plugin for displaying native Google Maps.